Washington, D.C., April 12th – While nationally 111,804 jobs were gained by people with disabilities, 1,156 went to people with disabilities living in Washington State. The newly published 2018 Annual Disability Statistics Compendium shows there are 480,828 working-age (18-64) people with disabilities living in Washington State. Out of that number, only 194,948 have jobs. That means that the Evergreen State has a 40.5 percent disability employment rate. Further analysis by the nonpartisan advocacy group RespectAbility shows that Washington now ranks 20th in the nation in terms of jobs for people with disabilities. In May 2013, Gov. Inslee issued Executive Order 13-02 “Improving Employment Opportunities and Outcomes for People with Disabilities in State Employment.” The order directed, among other things, that state government adopt the goal that by June 30, 2017, five percent of the state workforce be comprised of people with disabilities, and that the Office of Financial Management convene a Disability Employment Task Force for the purpose of assisting state agencies with recruitment and retention of persons with disabilities. The task force provides recommendations on how to achieve the employment targets established in the executive order, guidance and other support to agencies and institutions of higher education on recruitment, retention, accommodation, and accessibility for persons with disabilities. With Gov. 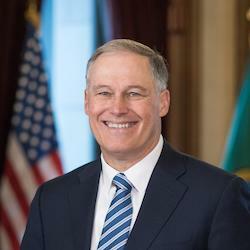 Jay Inslee’s signature in July 2017, Washington became the fifth state in the U.S. to establish a paid family and medical leave program for workers — and arguably the most forward-thinking one in the nation. The new law Inslee signed was passed by the Legislature with strong bipartisan support and will be in place by 2020. It creates the Family and Medical Leave Insurance Program, which will provide everyone in the workforce with up to 12 weeks of paid medical leave, and up to 12 weeks of paid time off to care for a new child or an ailing family member. As Gov. Inslee joins the crowded Democratic Presidential field and the political campaign season heats up, continuing job growth for people with disabilities will be a crucial indicator of the health of the American economy.